NEW YORK - Dec. 10, 2018 - PRLog -- Perennial Pictures announced the release of the new high definition, extended 30 minute video, Crawford The Cat's Christmas. Streaming on Amazon Prime, the video is free to Amazon Prime members. 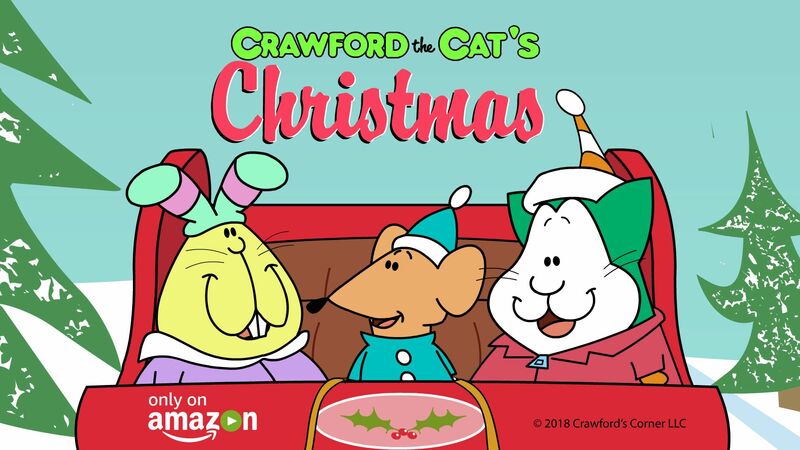 Non Amazon Prime-members can access Crawford the Cat's Christmas for $4.99 (HD) / $2.99 (SD) to buy and $1.99 (HD) / $0.99 (SD) to rent. Lessons around social etiquette and healthy habits abound in "Crawford The Cat's Christmas." Crawford has big plans when he wakes up on Christmas Eve morning. He expects that he and his friends will go ice skating, sleigh riding, Christmas tree shopping and gift shopping, all before noon. Sadly, Crawford soon learns that his favorite Aunt Kittypat is snowed in and won't be coming for her annual holiday visit. Crawford's friends make the best of this disappointment until an unexpected visitor brings a joyous surprise. "In this new holiday video, Crawford The Cat expresses the excitement and pure joy of the holiday season including fun with friends and family," says Alita Friedman, CEO, Alita's Brand Bar. "Crawford truly models the important social skills young kids need today including respect for others and resilience in the face of disappointment. He always bounces back to show kids the best way to be." Crawford the Cat is the upbeat, animated series about healthy habits for young children, ages 2-7 used by thousands of educators in classrooms across the nation to teach kids about good citizenship and healthy habits. Addressing young kids using colloquial and contemporary language, the crafty feline exemplifies behaviors kids instantly want to watch and model over and over again. Crawford's Corner LLC owns the intellectual property for Crawford the Cat, the lively animated series created and initiated in 2003 by Perennial Pictures Film Corporation, based in Indianapolis, ID. Embraced by early childhood educators in classrooms as well as kids nationwide, Crawford the Cat teaches young children, ages 2-7, about social etiquette, personal responsibility and healthy habits, such as oral hygiene, hand washing, nutrition and playing well with others. The complete Crawford the Cat library, available on Amazon Prime Video, and YouTube, currently includes 13 five-minute episodes, online games an an iPad app. For educators, there are companion lesson plans, printables and eBooks available. For more information visit www.crawfordthecat.com.